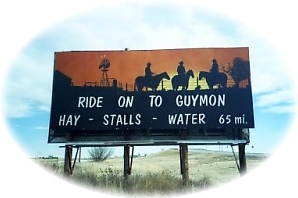 Guymon maintains its image as "An American Original" throughout the year. As the largest, most centrally located city in the panhandle. Guymon is the business and retail center of the region. The annual Pioneer Days Celebration is held in the first full weekend in May. The professional rodeo held during this time is the largest PRCA rodeo in Oklahoma. Over 850 contestants compete, more National Finals Qualifiers competing than you'll see in Las Vegas at the Finals. Thompson Park, an oasis on the panhandle, was the first municipally owned Oklahoma lake to stock trout. The lake also has premier catfish and blue gill fishing. Sitting to the north of the park, across the dam is the Guymon Game Preserve. More outdoor recreation can be found at the Optima Dam Recreational Facility which is an excellent hunting area attracting hunters from all over the United States for prime pheasant and deer hunting. Enjoy golf at the beautiful 18-hole Sunset Hills Golf Course and plan to visit any time throughout the year to take part in Guymon's major events and festivals. Edward T. "E.T." Guymon was born in Illinois in 1859. In his early 20s, he came west to McPherson, Kansas, where he worked as a grocery store clerk. Eventually, Mr. Guymon acquired an interest in the store. The Rock Island Railroad began pushing southwest in the spring of 1888 and reached Liberal, Kansas. Mr. Guymon established the Star Grocery Company in Liberal. In the 1890s Mr. Guymon speculated the next town to come up along the future railroad would be west of the Beaver River. He purchased a section of land, which eventually became the original town of Guymon. First named Sanford, the railroad changed the name to avoid confusion with the city of Stratford further down the line. The Rock Island officials telegraphed Guymon and asked his permission to name the town, Guymon. E.T. Guymon established the Star Mercantile on the site now occupied by Stanfield Printing. He was the largest stockholder and first president of the City National Bank. Sitting to the north of Thompson Park, across the dam, is the Guymon Game Reserve. Driving up to the reserve fence or sitting on one of the park benches, you may be able to view Aoudad sheep, llamas, buffalo, prairie dogs, African Watusi and Longhorn cattle and elk.